Our beginner courses start with taster sessions and British Canoeing Paddlepower courses to get people involved in watersports. If you would like a more formal introduction, we also offer British Canoeing 1 Star courses run by our trained coaches, and occasional pool sessions to help develop your skills further. When you sign up to the course we’ll send you a registration form requesting more information from you. If you aren’t a member we will also send you a membership form. PLEASE NOTE – our courses fill up quickly and places are in sort supply. If you choose to cancel the course we will only refund your fee if we are able to find a replacement participant. First Saturday of the month from May. Taster sessions. This is aimed at those who’ve not paddled before and the sessions follow the British Canoeing Start Syllabus, with an emphasis on fun and enjoying being on the water. Book online at Eventbrite. The training will be led by Brian Biffin (contact him for details). A training session to develop basic skills, safety awareness plus thoughts on “which board is best for me”. Paddlepower courses are a great way to introduce new paddlers to general purpose (GP) kayaking as well as other disciplines, like racing. Courses are run throughout the Easter and Summer holidays – get in touch below to register your interest. 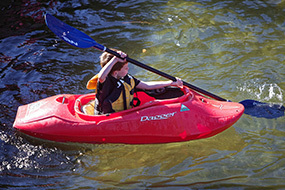 These courses are for anyone who wants to gain basic competence in kayaks or canoes. As a guide, you may have tried canoeing before somewhere and now know you want to do a proper course or you may have been on one of our taster sessions and now, we hope, want to do more. Find out more here. For those graduating from Paddlepower and wanting to develop their racing skills, we offer an introductory course for flat water racing. We still have one more course scheduled to run in July 2018. More information can be found on our flatwater racing training page. During the warmer months, members can gain access to the Aldershot Lido in partnership with Blackwater Valley Canoe Club. Contact us for more information on how this works and check our club calendar for dates of upcoming sessions.